I had so much fun with the ladies of Luscious Hustle! Take a listen! 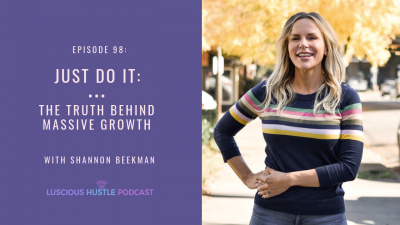 In today’s episode, we are excited to introduce you to Shannon Beekman, the founder and creative force behind Urban Waxx, a west-coast salon that solely focuses on waxing services. She is obsessed with providing unparalleled customer service, and creating an environment in her salons that not only supports her clients, but helps her employees grow and thrive as well. Today Shannon is here helping us break down how she identified a specific need in the spa market, elevated the waxing experience, and then created a multi-location business with a single mission in mind: deliver over-the-top guest service, while still having fun.